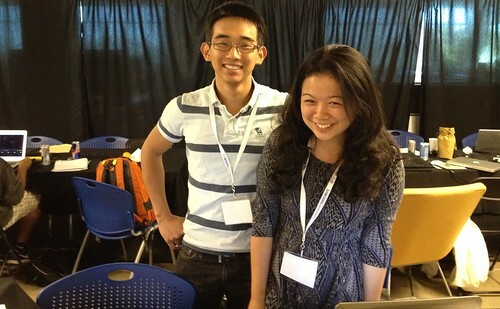 Plug & Play at The AngelHack Summer 2012 Multi-City Hackathon! Update: To learn about the exciting conclusion to AngelHack, see our latest blog post - AngelHack National Demo Day - July 12th - here. Last weekend Plug & Play’s Developer Evangelists, Gregg Alpert and Anthony Cuellar, took AngelHack (the largest national hackathon) by storm in San Francisco and New York respectively. To cover Boston we were able to enlist Peter Whitmer from Pearson Education, but unfortunately we were only able to be present virtually in Seattle thanks to Twitter. Though still slightly jetlagged from our time in London, we were really excited for the event especially with access to a new platform called hackathon.io created by the founder of AngelHack Greg Gopman. The platform is a great addition to the world of hackathons because it allows participants to connect prior to the event, discuss ideas, form teams, and make connections. This is typically a difficult process at hackathons because attendees often meet onsite for the first time, well done Greg & Co! 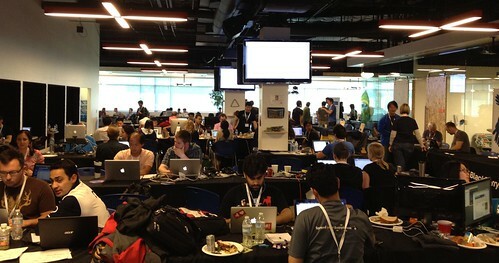 AngelHack New York took place at the Microsoft Technology Center in midtown with 200-ish hackers spread across the entire sixth floor. Registration, networking, and pitches began at 9 AM on Saturday June 23rd before lunch and sponsor talks. In addition to Pearson, representatives from Facebook, HTC, Qualcomm Labs, CloudMine, and Samsung Developers were also onsite geeking out and chatting with the developer community. 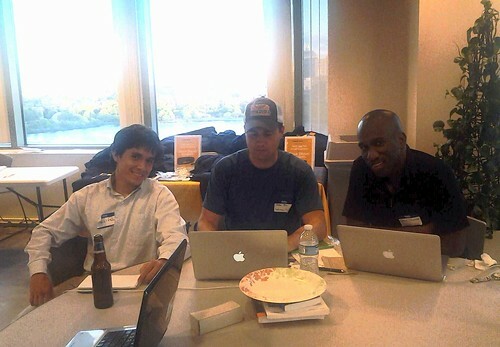 Promptly after sponsor talks, developers jumped into the intense 24 hour hackathon! All teams were hard at work brainstorming and building up until 10PM when we got moved over to The Hatchery for the #GeekSlumberParty. I didn’t spend the night but stayed well into the night, sleeping at home with one eye open to answer questions via Twitter and email. I was back on-site Sunday morning assisting teams and eagerly anticipating demos at 5PM! Four teams used our APIs in New York, and one team used not one, but four of our APIs to create four apps! Of the four teams, two made it to the demo round including Menu Bird (who sadly were not on hand to present) and ClickSlide. AngelHack SF had around 300+ hackers in attendance, with most focused on producing something that would stand out from the pack. Out of the 80+ app submissions in San Francisco alone, 30 made it onto round 2 where they had the opportunity to pitch to a group of judges: Jeff Tannenbaum, Dom Sagolia, Niko Bonatsos, Sana Choudary, David Chen. Each team had 2 minutes to pitch followed by 1 minute of Q&A. It was really inspiring to see teams hacking to solve some big problems in addition to building cool new tools and apps. GiveGo stole the show by turning daily exercise into charitable fundraising (Video Demo). Their video and live pitch were extremely tight, concise, and clear. Their UI was clean. They identified a challenge in the charitable giving market, an opportunity to grow the market, and how to solve the problem of inefficient use of money raised. By pitch time they already had 100+ beta sign-ups! Wordflare - One of Michael Siedlecki's three creations over the course of 24 hours integrated FT Press API and the Longman Dictionary API along with Facebook APIs to create a social cloud reader that makes reading content a social experience. Wordflare won the $5K Facebook prize. The Learning Man: Gamified word app to prep for the SAT. Fly.io: This team utilized their laptop cameras to control the mouse cursor through eye movement and mouse clicks by blinking! Peter checked in with us throughout the sold out Boston hackathon which took place in the swanky Cambridge Innovation Center, noting that hackers were both enthusiastic and brilliant. A few of his favorite demos included Hubster, a cross-platform content aggregator (Video Demo), Infopill (Video Demo), an HTML5 game called Scale (Video Demo), and the crowd favorite - a multidimensional infinite space application Thoughtpod (Video Demo). Next Study Group mashed up the Nursing & Health Survival Guides with Google Hangout to build the most convenient place for students to find and participate in study groups, either locally or virtually (Video Demo). 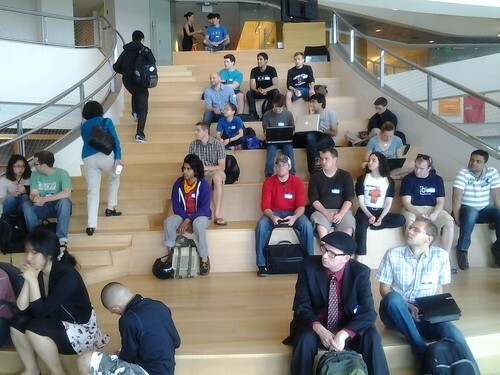 Hackers waiting to get started in Boston. As mentioned earlier, we were not onsite for the Seattle hackathon but we were engaged and cheering on #TeamCaringBag who used our Pearson Kitchen Manager API! Check out their Video Demo here! Big thank you to all of the enthusiastic hackers who came to play, engage, and give feedback to our team! Thank you Angelhack for putting on a great event and to the sponsors for making it possible! Hope to see you all very soon. Check out a full gallery of our pictures from all three hack events here.